Please enter the quantity of people in your reservation group. We encourage you to consider an optional donation to help support the programs, events and general operations of the not-for-profit Green-Wood Historic Fund. Even a $5 contribution (and, of course, we're delighted to accept a larger amount as well) provides tremendous assistance to this treasured National Historic Landmark. 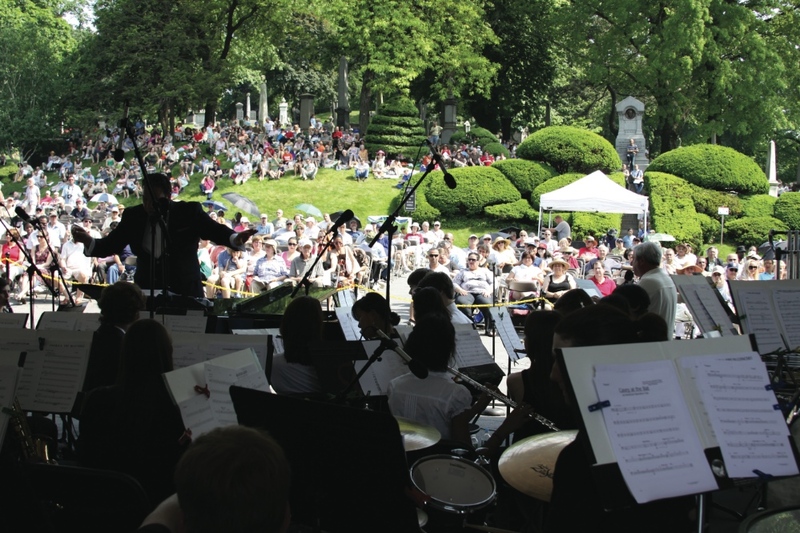 Now in its 14th year, Green-Wood’s annual Memorial Day concert has become a true neighborhood favorite. The concert features the ISO Symphonic Band, founded in 1995 to sponsor talented students throughout New York City and led by ISO’s inimitable founder and conductor Brian P. Worsdale. Each year we feature the works of Green-Wood’s permanent residents Fred Ebb, Louis Moreau Gottschalk, Leonard Bernstein, and many others. Bring a blanket and enjoy this early summer performance. Food and refreshments will be on sale all day. The concert is a free event, but please register your group online via eventbrite so that we can gauge response. A trolley “mini-tour” begins right after the concert, featuring highlights of Green-Wood, including De Witt Clinton’s bronze statue, Battle Hill and the Civil War Soldiers’ Lot. The tour is $5 for members of The Green-Wood Historic Fund and $10 for non-members. Seating is limited. Reservations recommended. To purchase tickets, call 718-210-3080 or click here to order online. The Green-Wood Historic Fund's mission is to maintain Green-Wood's monuments and buildings of historical, cultural and architectural significance; advance public knowledge and appreciation of this significance; and preserve the natural habitat and parklands of one of New York City's first green spaces. Please note: all ending times listed are approximate, and all tickets are non-refundable unless event is canceled or rescheduled (in which case ticket price minus service fees can be refunded).